Classical Opera and The Mozartists opened their 2018-19 season this Tuesday 18 September 2018 at the Wigmore Hall with a concert that culminated in a performance of Mozart’s pastoral comedy the one-act singspiel Bastien und Bastienne. Following the rediscovery of the 1768 autograph manuscript this was, it’s claimed, the first performance of the original setting since its premiere 250 years ago. Ian Page conducted The Mozartists with Ellie Laugharne and Alessandro Fisher as the titular Bastienne and Bastien and Darren Jeffery was the local quack Colas. The programme kicked off with some musical context, a performance of Haydn’s Symphony No.49 also dating from 1768. From the opening portentous Adagio, Ian Page was determined to bring out the intensely expressive dynamics. Perhaps the sombre opening is the reason the work attracted the epithet ‘La passione’, but I didn’t buy the idea that overall this is a tragic piece, and certainly not as Robbins Landon would have it, depicting a “winding line of penitents”. The passion and vitality of Ian Page’s reading were exultant, there was an ebullience that belied the minor home key and the turbulent expressiveness that propelled us on to the magnificent Presto. The anonymous arias, from Teutsche Comoedie Arien, which followed whilst charming and finely sung fell a bit flat for me, even with a translation in front of me the satire seemed too far removed and no amount of comedy gurning could fill the gap. The main attraction Mozart’s parody of the pastoral genre, Bastien and Bastienne, was a breath of fresh air. No matter how jaded you’re feeling Mozart is just the tiramisu. The story, such as it is, tells of the lovers’ tiff and their reconciliation after the intervention of the local quack “magician”. 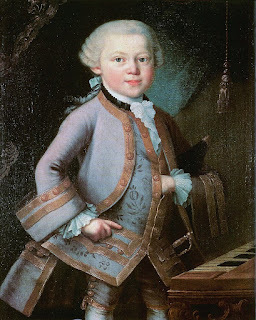 It might be a slight work but even at the tender age of 12 Mozart was capable of some stylish vocal writing and the singers made hay. Ellie Laugharne is a natural actress with a meltingly mellifluous soprano who brought an insouciant charm to Bastienne. As Colas, Darren Jeffery did the orotund business, but I’m surprised he didn’t make more of the recitation of Colas’ spells ‘ Diggi, daggi, shurry, murry’. Alessandro Fisher played Bastien as a honey-toned dolt who can’t wait to get his hands on Bastienne’s valuables. Some of the humour though didn’t travel into the 21st, Colas’ insistence on a couple of kisses in payment felt a bit creepy rather than charming and there were a few ewwws. The playing from The Mozartists was as light and stylish as one could wish and whilst the piece is basically a bit of fluff what it lacked in sophistication was certainly made up for by its delightful performance. Mozart: Grabmusik, Bastien und Bastienne - Anna Lucia Richter, Jaques Imbrailo, Alessandro Fisher, Darren Jeffery, The Mozartists, Ian Page. Available from Amazon.